The build quality is great. I consider myself a rough driver who pushes the car a lot. The car has now racked up 100,000 miles on it and still drives as smooth as the day I purchased it. The interior has held up nicely as well with no tears or cracks in the leather or dashboard. The front bumper and hood show some aging, probably because the color of my car is white, with chips and scratches that are pretty noticeable. I have had no engine issues with the car since I purchased it as I stay of top of maintenance. The only thing I dislike about the car is the absence of window tints, which is entirely my fault. During the Texas summer heat, the inside of the car get to be unbearable to sit in if it is parked in a surface lot. I don't have any memorable stories that stick out to me, but I enjoy taking the car out on a drive during the night and driving down the streets enjoying the view. The comfort and quietness in the cabin makes the experience even more enjoyable. The most favorite feature this car has is an AUX input. I love to listen to music and podcasts whenever I am in the car, and having that in the car lets me control what I listen to. I don't have to rely on the radio or making CDs to listen to songs I like. I also love the smooth comfortable ride that my car provides. I often take trips between cities, so having a comfortable ride is really important since I have sat in other car during long trips with back pain towards the end of it. I'm really big on performance, so knowing that my car packs a punch puts a smile to my face. I know that whenever I need it, I can rely on my car to deliver the power to overcome whatever obstacle presents in front of me. There is not a lot that I find negative about this car. One thing that sticks out to me the most is the absence of Bluetooth connectivity. My car does connect my phone via Bluetooth but not to the point where I can control the music on my phone. It only allows for phone calls. Another con that has surfaced more recently is the fuel economy. Back when I purchased the car, the fuel economy that this car provides was one of the best. Know when you look at the market for cars, there are cars that get MPGs in the high 30s/low 40s. Since I make a lot of long trips, having a car that provides that king of fuel economy is something that I am missing out on. 2013 Lexus ES 350 - Excellent quality but not as good as my previous 2008 model. Overall, it's an excellent vehicle. Lexus gives excellent customer service from their dealers. The car looks nice and has many details done right. A few details are lacking compared to earlier models. For example, on my 2007 model, all cars came with a full-sized spare. Now, it's a donut. The navigation system is very poor, and it doesn't seem like it was even tested by real people. It's very roomy with good performance. Although, again, the prior model had slightly better performance, particularly on cornering and performance handling. The interior and sound system makes for a very comfortable ride. It does have an assist and emergency contact features. Mine was a gift, so it was an awesome surprise in the driveway one day. My husband knew I was wanting to get a new Lexus so he bought it for me... I had no idea. I thought the old car had broken down since he called my stepson for a ride. I was in the house working, and they came out and was like, "you have to look at the car outside." I thought it was our old car. But in the driveway was the new Lexus. Bow and all. Great Christmas present and he did good. I like the darker gray color and options he chose. Decent gas mileage. Lots of options. Nice performance. Very comfortable seats. Looks sharp. Interior well made. Nice sound system. Spacious back seat, enough for adults. Good electronic readouts of everything (like tire pressure). No full-sized spare tire. Awful navigation system. Seats tear easily (leather thinner). Reminders for maintenance awkward and come up over important information. When you put car in reverse, words come up over rear-view camera cutting off the field of view for several seconds. Awkward analog clock. Who can read the time off that while driving? Hard to get certain parts in less populated areas. 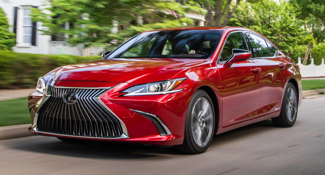 2015 Lexus ES 350 - Great buy and retains value! I love the ride of this vehicle! I have owned many cars and this car is the smoothest riding vehicle I have ever driven. I feel safe and secure in it. There are more good things and few negatives to this car. I bought it used and it already has almost 50K on it but it runs great! I love that it's an automatic and V6 - it has great pick up and I have more confidence driving in this vehicle. My kids first got in it and loved how big it was and easy to travel. We took it down to Disney and had plenty of room. This is a safe car. It is not too big, but big enough to feel safe in. I love the back up camera the most, and also the sun roof. Another plus is that it has a toggle that allows you to navigate the menu screen which is a great tool and fun to use. Also, the sun roof and fact that it's a V6 make it the fanciest car I have ever driven. Also has heating and cooling seats! There are few negatives. I only have 2 right now and they are very minor. I don't think the speaker system is that great, but I don't know that might have been something the old owner did to mess with things or blew out speakers. Also, the holes in the seats (that are meant to be there)...if you eat in the car stuff can get down there which is annoying and impossible to clean.